For Private events and when attendees are uploaded to a live event, now you have some flexibility around a few things. To view these options the (1) event status must be set to "no active" and the (2) event type must be either "Private Listed" or "Private Unlisted." These options are found on the "Event Details" screen. 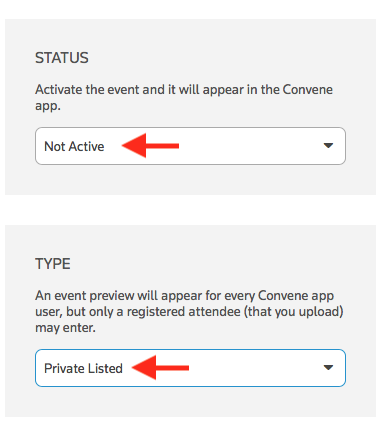 The first option option is to set a generic event invitation code that attendee's can use to access the event. Think of this is a "general admission ticket." Instead of, say, email attendees a unique invitation code, you can set a generic one and share it with people in other ways outside of Convene (your own email marketing campaigns, onsite signage, and more as you see fit) and also via Convene (more on this below). 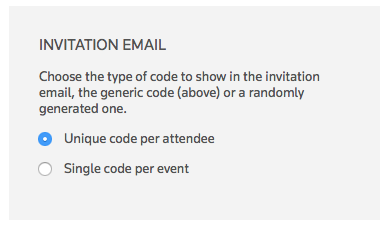 When "Event Code" is populated, in addition to a unique invitation code the generic code will also get them in the door. 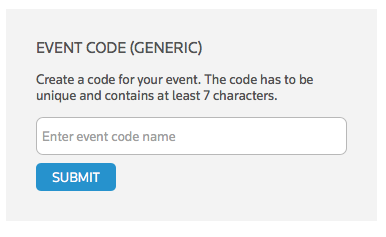 Once you populate the code, which must be unique across all of Convene, you must click the "Submit" button which will check the code's validity and also save and apply it for your event. Note: Just because the "Event Code (Generic)" is set does not mean that attendees will receive it, you must set that option below! UNIQUE CODE PER ATTENDEE means that when the (1) event is active, and (2) attendees are uploaded the (3) emails dispatched will contain a unique, randomly generated code (ex: MEU83N) that each attendee must enter into the Convene app in order to gain access to the event. SINGLE CODE PER EVENT means that when the (1) event is active, and (2) attendees are uploaded the (3) emails dispatched will contain a general code, for example, "SUMMIT17" that each attendee must enter into the Convene app in order to gain access to the event. You can now set a generic event invitation code. So set the code, the event status must be, Not Active. It only works for the Private type of events. You have options for the emails that Convene sends to attendee to either include the (1) generic code or the (2) unique randomly generated code.